A limited number of staterooms remain available spread across a range of 10-night voyages between May and August 2019. Alternatively, consider selecting one of the 10 voyages scheduled for 2020. All PONANT Kimberley expedition voyages are accompanied by an experienced Expedition Team, experts in their fields, keen to share their knowledge and enthusiasm and give guests a greater understanding of this unique region when exploring ashore during one of the regular exploration opportunities, or onboard with informative presentations and casual discussions. Harsh yet magnificent. Seemingly uninhabitable, yet inhabited for perhaps 40,000 years. You will return home with multiple memories and photos of vertiginous waterfalls, towering sandstone walls, horizons of intense blue sky and contrasting mauve peach sunsets. Exploring with the expedition team in Zodiacs, watch for a slight disturbance in the mangroves - home to the world’s largest living reptile, the saltwater crocodile. 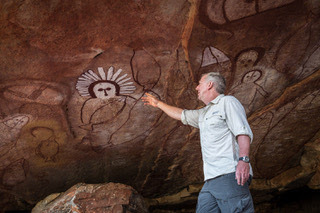 Marvel at extraordinary tidal movements and view truly ancient Gwion Gwion Aboriginal rock art galleries. These intricate and complex depictions of the human form may be more than 5 times older than Egyptian Hieroglyphs. Optional excursions include helicopter flights up to the Mitchell Falls and plateau, an exclusive scenic flight in a vintage Paspaley Grumman Mallard and a fast boat ride through the Horizontal Falls! “Le Lapérouse offers all the accoutrements of luxury travel and amenities - including an infinity-edge pool and sea view spa - however its compact size, with just 92 staterooms and suites, all with balconies, allows for the personalised style of service PONANT is known for. Importantly, smaller size provides access to remote parts of the world where large ships simply cannot contemplate venturing” says Monique Ponfoort, Vice President PONANT Asia Pacific. Nineteen 10 night voyages between Darwin and Broome (or vice versa) during 2019 and 2020 currently available from A$11,150 pp(1), in Deluxe Stateroom with private balcony on board Le Lapérouse. 2019 LAST STATEROOMS for the Kimberley! 9 Departures between May and August 2019. *AUD1,600 savings per stateroom based on a double occupancy, $800 savings per stateroom for single occupancy. Offer valid for clients travelling with PONANT for the 1st time. Not redeemable for cash, not retroactive, not combinable with any other offer and valid only for new bookings made before 30th April 2019. ^ PONANT Bonus per person, based on a double occupancy, including accommodation and all meals onboard, Open Bar, 24 Hours Room Service, Zodiac Expeditions and lectures, port taxes and transfers port to airport or v.v. in Broome. Fares are yield managed, correct as at 20 March 2019. The Kimberley coastline extends over 12,000 kilometres and contains more than 2,500 islands. On board, the luxury expedition small ship Le Lapérouse experience all the coast has to offer in extreme comfort with a highly attentive crew to look after you. With every stateroom on Le Lapérouse featuring a private balcony, this is a very civilised way to explore a remarkably remote destination, imbued with PONANT’s trademark dash of panache. Launched in July 2018, Le Lapérouse is now positioned in Australian, Melanesian and New Zealand waters as part of its inaugural season of voyages in 2019, returning again in 2020. PONANT’s position as the world leader in luxury expeditions. In addition to visiting areas with high concentrations of saltwater crocodiles, the voyages coincide with prime time for observing the largest population of migrating Humpback whales in the world - estimated to be over 36,000 individuals or more - and with a compact ship and 10 Zodiacs this is potentially another exciting experience.